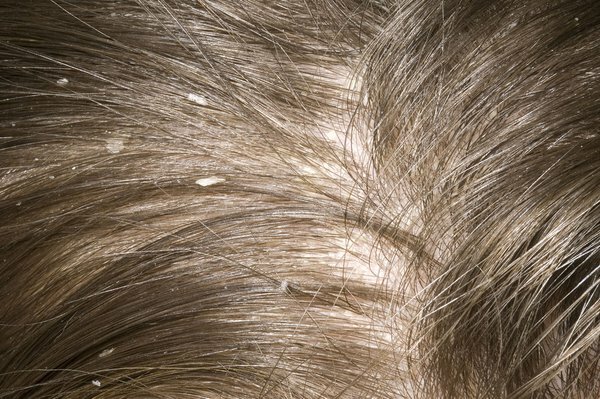 Dandruff is a common skin condition that causes white or grey flakes of skin to appear on the scalp and in the hair. The flakes are often noticeable if they fall from your scalp on to your shoulders. Your scalp may also feel dry and itchy. Dandruff isn't contagious or harmful, but it can be unpleasant and difficult to get rid of. The main treatment for dandruff is anti-dandruff shampoo. There are a number of types available to buy from supermarkets or pharmacies. Make sure you read the instructions that come with the shampoo before using it to check if it's suitable for you and see how often it should be applied. A pharmacist can offer advice if you need it. It's particularly important to leave the shampoo in your hair for at least five minutes before washing it out. Try these shampoos for a month to see if your dandruff improves. You might need to try more than one type to find one that works for you. You may be able to use the shampoo less often once your symptoms improve, but your dandruff will probably come back if you stop using it completely. Your GP can examine your scalp to check for skin conditions that could be causing your dandruff – see causes, below. They can also prescribe stronger treatments, such as medication that contains coconut oil and salicylic acid in combination with a steroid lotion, mousse or shampoo. Your skin constantly produces new skin cells and sheds old cells to stay healthy. Dandruff can occur when this cycle of skin renewal speeds up. This leads to patches of dead skin forming on the scalp that come away into the hair. Dandruff isn't caused by poor hygiene, although it may be more obvious if you don't wash your hair regularly. Stress and cold weather may also make it worse. Babies can sometimes have dandruff and yellow, greasy, scaly patches on their scalp. This is known as cradle cap. Cradle cap appears most often in babies in the first two months. It tends to last only a few weeks or months. Gently washing your baby's hair and scalp with baby shampoo can help prevent a build-up of scales. Massaging baby oil or natural oil, such as olive oil, into their scalp at night can help loosen the crust. Read more about cradle cap.